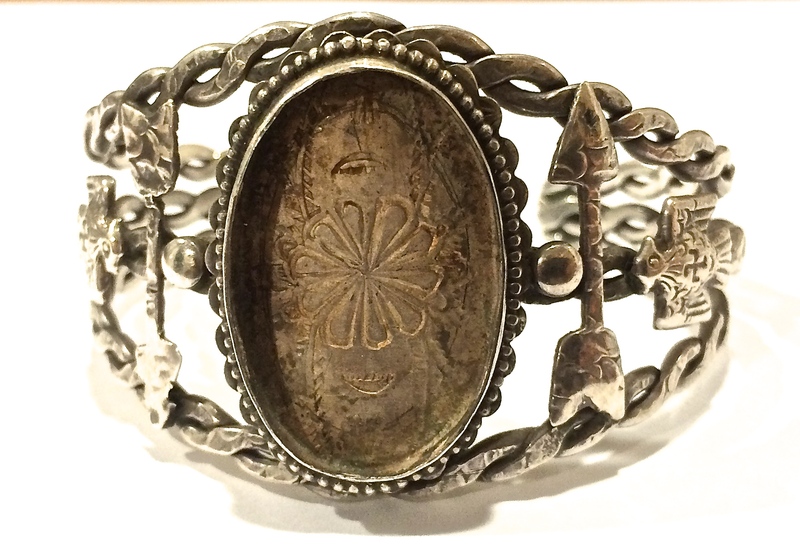 About ten years ago (or perhaps a few years more than that) I purchased a silver bracelet from the “sale” basket at the Heard Museum. It was an old piece that I have come to love and for which I often receive compliments. The bracelet itself is fashioned from three double strands of open braided “rope” with the rough piece of turquoise set in the middle. 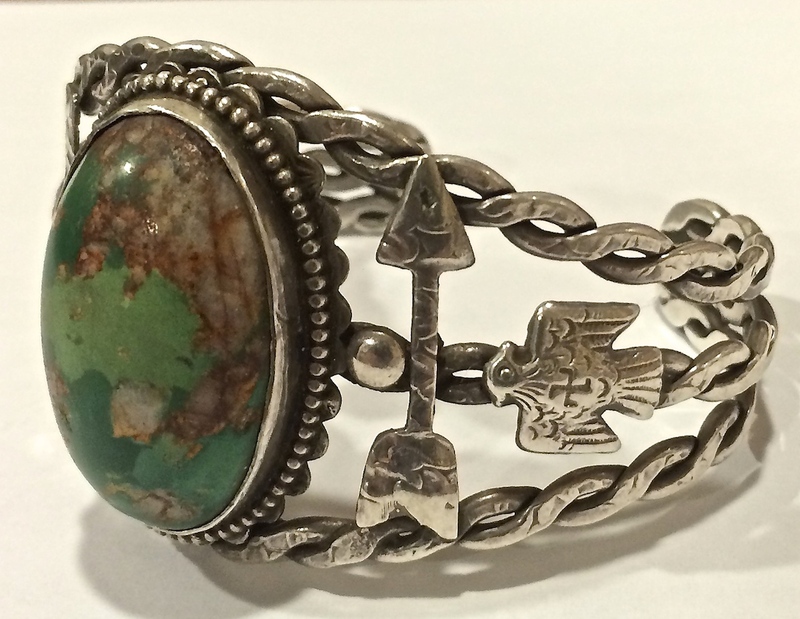 On each side of the bracelet on top of the “rope” is a right facing arrow below that is a right facing eagle. There is a hammered finish to the entire piece. Pictures are available of course. Can you help? Thanks so much. First of all, thank you for your patience. This is the last question from April – I am trying to get caught up! Second and more importantly, what a great bracelet ! I can see why you bought it ! For those not familiar with Heard Museum, you can read about it here. handmade arrows and a beautiful Turquoise stone. As far as the pattern underneath the stone, rather than a hallmark, I think it is more an indication of re-purposing a piece of silver that had been used or started for another project. Perhaps other readers have comments. 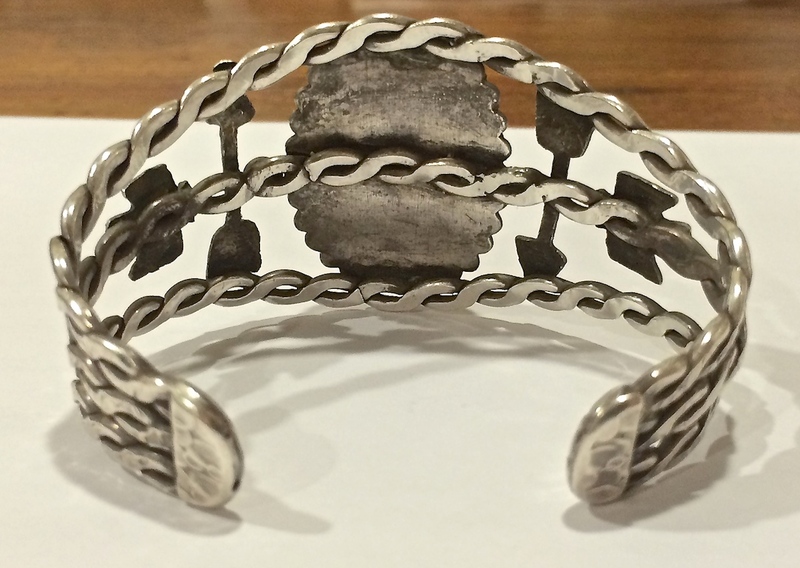 Vintage Bell Trading Co. nickel bracelet. I admit, a few days ago, I knew nothing about Navajo Rugs but we recently purchased a large estate collection of Navajo items from the 1970s. 99% of the collection is jewelry but the rugs………well………I had to do some studying just to get a general idea of how to describe these. The family who inherited the collection graciously provided me with some information from their mother’s notes and there are tags on a few of the rugs. Also, luckily, we have some friends who have collected Navajo Rugs for 40 years and they pointed me in the right direction. These rugs are from the 1970s to 1990s. Unlike most Navajo rugs which are the same on both sides, this style of the rug above has a front and back. The front has more vibrant raised outlines while the back is more subdued. The New Lands design, also called Blue Canyon, was first seen at the trading post in Sanders, Arizona. Trader Bruce Burnham recruited dye experts to develop the colors and gave kits to local weavers to try out. The name is derived from the area around Sanders which is referred to as New Lands as many residents were relocated there from traditional homelands. The design is a derivative of a Teec Nos Pos design but having more complexity. The pattern is enhanced with a raised outline. These are often large, expensive rugs. New Lands patterns incorporate a combination of pastel colors similar to those in traditional Burntwater rugs. These are warm earth colors, sometimes as many as 20 colors including brown, sienna, mustard, and rust with accents of rose, green, blue, white and lilac. As the name indicates, an Eye Dazzler rug keeps the eyes moving over the busy, bright geometric patterns. This pattern is also called Optical Illusion and it is one of the earliest styles of Navajo weavings. Rather than being used as rugs or blankets, they were most often wall hangings, chair covers, room dividers or table runners. Klagetoh means “Hidden Springs” and is the name of a small settlement south of Ganado, New Mexico. A Klagetoh rug is similar to the classic Ganado red rug but it has a predominately grey background. Usually a Klagetoh is an elongated diamond shaped design. Hand woven in grey, red, black, gold, and white on the order of Teec Nos Pos which means ‘Circle of Cottonwoods’. There are several Teec Nos Pos designs, often using stylized arrows, feathers, lightning, squash patterns and a general pattern of zigzags. So this time, I’m asking for feedback from any of you who are Navajo Rug experts !! Please let me know what you know ! While metal detecting found a vintage Boy Scout Badge or Native American pin? I have been trying to see what this item is and thought it was a boy scout pin of some kind. I found it while metal detecting near a spot here in Illinois where a pool had been in the early 1900’s. It was pretty deep, leading me to think it has been lost for a long time, but you never know. It appears to be all silver because it was not tarnished in the least, is about 1.5 inches across the top. The back is plain except for two loops that appear to be soldered on. One is open to receive a pin, and the other appears to have held a pin that has corroded away. My guess is the pin was not stiff and was intended to be inserted and then fed into the loop. Does not seem like a good design, but that is all I can figure out. No markings other than the symbols on the front. I posted on a metal detecting site and asked if anyone knew what it was. 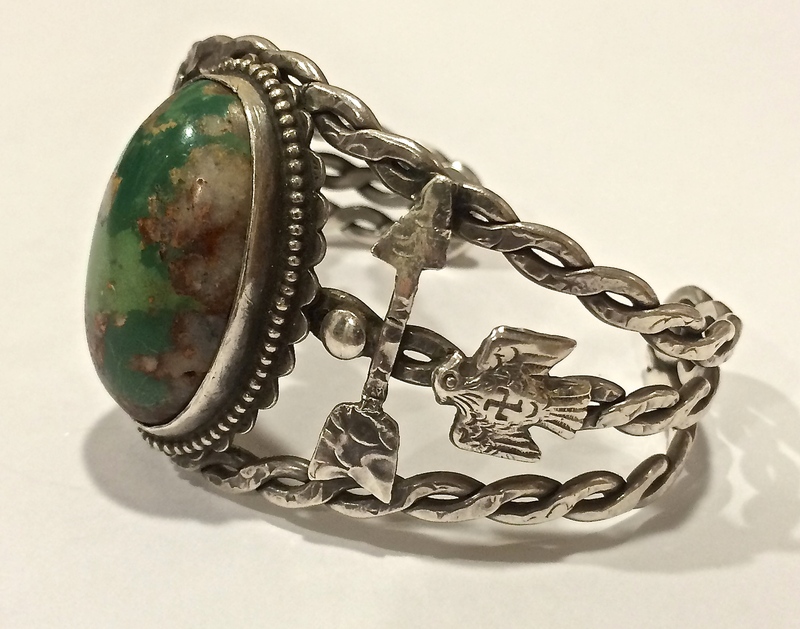 One person suggested it might be actually native american or trade silver. The other suggested it might be an old scout “order of the arrow” award or honor. Since you specialize in similar new native american items, I thought I would take a shot to ask if you had any clue. I can see why you might think this might be a vintage Boy Scout badge. It almost looks like something one might wear over the top button of a shirt with a collar. Or on a pocket flap. To me it is reminiscent of Fred Harvey era Native American items such as were sold at Bell Trading Post. 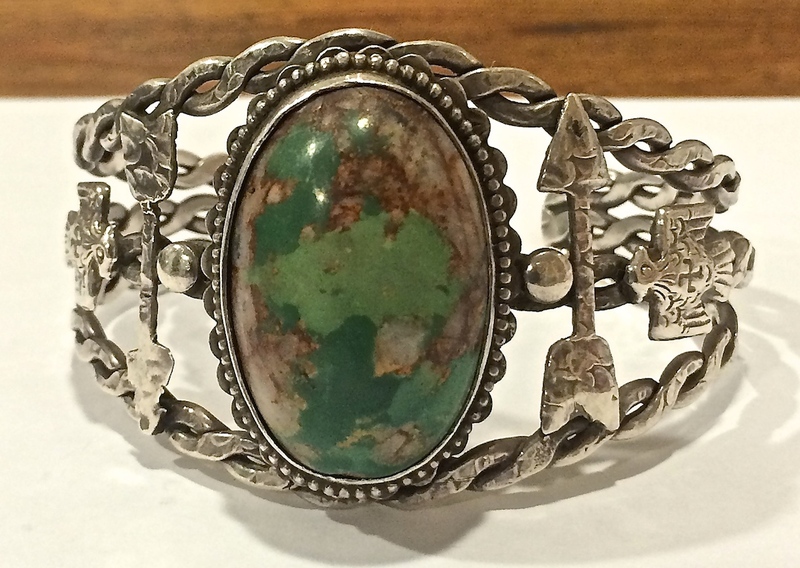 Fred Harvey was an entrepreneur who created an avenue for Indians to make and sell jewelry to the tourists. Jewelry of the Fred Harvey era has typical Indian kitsch of arrows, tomahawks, tipis, thunderbirds and so on and was most produced from 1930 throughout the 1950s. Read more about Fred Harvey here. The very symbols on your piece (crossed arrows and rain clouds with rain) were quite common on jewelry from that era. Have you tested it for sterling silver or silver to verify? Cool piece. Maybe another reader will leave a comment here if they have seen something similar. HERE ARE SOME PHOTOS OF THE BACK OF THE PIN TO SHOW SCALE AND TOOL MARKS.